Choose either the French Language and Culture program or the Intensive French Language program. No AIFS participant is permitted to take a course without receiving a letter grade. Pass/Fail options are not available. This program is designed for students with an intermediate or above level of French who wish to improve their language skills and take courses taught in French or English in subjects including art history, business administration, economics, history, literature and political science. Courses are taught at the Centre Universitaire d’Études Françaises (CUEF) at the Université Grenoble Alpes. All students take a French language course available at Intermediate, Advanced and Superior levels. 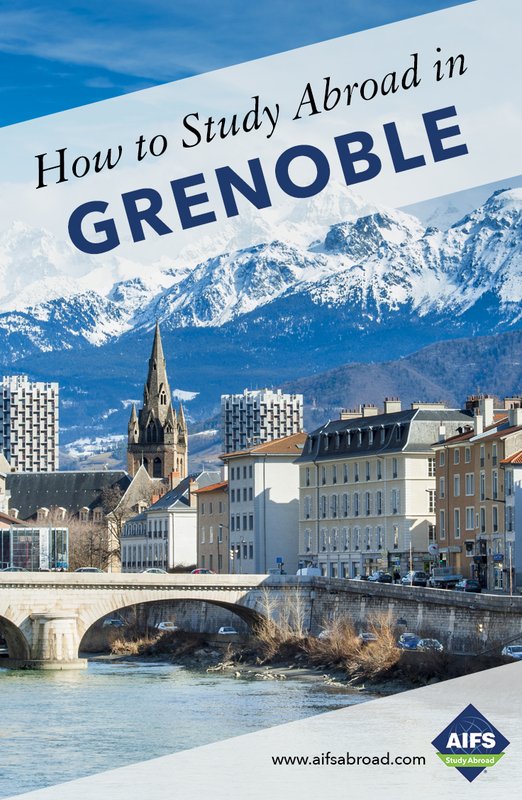 Your level of French is determined by a placement test taken after arrival in Grenoble. Then choose from electives taught in French or English. Most electives taught in French carry 2 recommended semester credits. Electives taught in English carry a recommended 3 semester credits. English electives require a minimum of 10 students to run. AIFS encourages you to take electives taught in French in order to maximize your learning experience in France and to get the most out of the academic program. The French Vocabulary Enrichment courses are particularly recommended and the Written and Oral Expression course for advanced level students. The minimum course load is 12 credits and the maximum course load is 18 credits. Students who place into the Superior level 401 and who have completed at least three years of college French take a minimum of two French Language and Culture program electives taught in French at the CUEF and have the option of taking one class studying alongside French students at the Université Grenoble Alpes depending on class schedule and availability. In addition to the standard transcript students may also receive an official university diploma for the semester. To be eligible for the diploma, students must select the additional language courses at their correct level: French Vocabulary Enrichment; Introduction to Linguistics or Written and Oral Expression plus three French electives corresponding to the placement level . Students on the French Language and Culture Program or the Intensive French Language Program can choose to take a service learning component in addition to the standard program courses. Students will design and run English language workshops for French high school students. They will work with CUEF professors to prepare the workshops and activities, prepare a research paper and give a presentation at the end of the course, as well as spending time in the French high school working with local students. This is a wonderful opportunity for students to fully engage with the local community. This course is in addition to the electives and does not replace them and is for a recommended 3 semester credits. The course requires a minimum of 10 students to run. A transcript will be issued by the CUEF Université Grenoble Alpes. A supplemental fee will be required for this option. Please contact the AIFS Admissions Officer for details. Students on the French Language and Culture program may also choose to give English language workshops for French undergraduate students. In coordination with a University English language professor, students will provide 15 to 20 hours of language assistance during the semester and be required to give a presentation on their activities. This workshop is recommended for 1 credit. It is in addition to the CUEF French electives and does not replace them. A transcript will be issued by the INPG/Université Grenoble Alpes. Students must have pre-approval from their home school. An additional program, the Diplôme Superieur d’Aptitude à l’enseignement du Français Langue Étrangère (Diploma of Ability to Teach French as Foreign Language) is designed for advanced level French or above students who are considering a career as a French teacher. For further details of this program, contact the AIFS Admissions Officer. This is available in the spring only. The University of Grenoble was founded in 1339 and now welcomes more than 60,000 students. Grenoble is one of the most sought-after universities in France and has an international reputation for excellence. In January 2016, the University changed its name to Université Grenoble Alpes and continues to develop and increase its reputation for research, innovation and diversity (academic and student intake). The University occupies a splendid campus on the outskirts of Grenoble (recently voted 8th most attractive campus by Times Higher Ed) at Saint-Martin-d’Hères. Grenoble is regularly voted the most student-friendly city in France. Foreign students learning French at the Université Grenoble Alpes are enrolled in the Centre Universitaire d’Études Françaises.